Way back before 1492, before the Old World met the New World, your human ancestors’ dinners would have been different from yours. Do you know what happened in 1492 that changed dinner? No matter where in the world people lived then, they started to experience new foods after explorer Christopher Columbus sailed back to Europe from the New World. Before seeds and plants were exchanged between the New World and the Old, there were no tomatoes in Italy; no potatoes in Europe; no corn or peanuts in Africa or Asia; no chili peppers in India or Thailand; no peaches, carrots, or broccoli in what we call North Carolina; and no rice, bananas, or cane sugar anywhere in the Americas. Imagine that! For hundreds and hundreds of years, travelers, explorers, and adventurers collected seeds and plants from faraway places. Folks moving to a new country packed seeds, plants, and even farm animals. Transportation was slow—by foot, boat, or animal power. Slowly, over many years, food plants and animals spread around the world as people explored and settled new lands. When you go to the movies, you may eat prehistoric American foods: popcorn, peanuts, or chocolate. People grew or ate these foods somewhere in the Americas before 1492. Peanuts began in South America, were taken to Africa by early European explorers, and traveled from Africa to North America many years later. Prehistoric people in tropical America enjoyed their chocolate unsweetened, instead of the sweet chocolate we love. Sugarcane took hundreds of years to travel halfway around the globe before finally getting to the New World. Suppose you sit down to a delicious dinner of turkey, corn, broccoli, and carrots, with banana pudding for dessert. What a global dinner plate! Let’s trace the genealogies, or where the foods came from. Turkey and corn are native American foods that the original North Carolinians ate, but seeds for the first broccoli and carrots in North Carolina came here with European settlers. Spanish or Portuguese explorers to Central and South America brought bananas’ ancestors from Africa. Today we eat the descendants of those bananas. Read the stickers on your bananas to find out where they were grown. Corn, the “Most Useful Grain” John Lawson—an Englishman who explored the interior of the Carolinas in 1701—wrote that “the Indian Corn, or Maiz, proves the most useful Grain in the World; and had it not been for the Fruitfullness of this Species, it would have proved very difficult to have settled some of the Plantations in America.” In most parts of the world, the most ancient and basic dish is a hot cereal made of whatever grain grows best in that place. So, the most historic North Carolina food may be grits, or mush, made of ground-up, dried corn. Mush has other names—such as porridge, hasty pudding, or loblolly—in other places. Even before the first Europeans and Africans arrived in present-day North Carolina, American Indians were grinding and cooking dried corn. The newcomers soon learned to eat this cornmeal mush. During the decades of European settlement, mush was the usual breakfast and supper dish. People often served it with butter, milk, or meat drippings (grease from cooking meat). Mush with drippings was the ancestor of today’s grits with “red-eye gravy” (country ham drippings) or sausage gravy. Here is a simple recipe for mush: Boil 1 cup of cornmeal and a little salt in 4 cups of water. Stir often until thickened (about half an hour). Since ancient times, cornmeal also has been made into a simple bread with many names: hoecake, johnnycake, journey cake, ash cake, griddle cake, or pone. North Carolinians still like their corn bread! Sugarcane may have the most amazing genealogy of all. It was first domesticated about 8000 BC in New Guinea. People then introduced this wonderful plant to Asia, before sharing it from place to place across Asia to the Middle East and on across Africa. Sugarcane finally reached Spain about AD 900. From there it went to the Caribbean on Columbus’s second voyage in 1493. What a journey! On a map of the world, trace the spread of sugarcane across the warm regions of the Eastern and Western hemispheres. American Indians made syrup and sugar from the sap of maple and other trees. Colonists imitated their methods. They also brought the European honeybee to America in the 1630s. The common sweeteners available in early colonial North Carolina were honey, maple sugar, and maple syrup. Neither was plentiful, and cane sugar from islands in the Caribbean cost a lot. By 1650, tropical America produced much of the world’s sugar. At that point, both cane sugar and molasses (sugar cane syrup) could be gotten easily in the Carolinas, but they were expensive. The syrup we now know as molasses is made from sorghum cane, not sugarcane. Sorghum was grown in America starting in the mid-1800s. The “Irish potato” is not Irish at all! Over two centuries, the potato traveled from South America to Europe and finally to the American colonies, including North Carolina. Potatoes originally grew only in South America, where Spanish and Portuguese explorers discovered them in the 1500s. Learning that potatoes could be kept for a while without spoiling and were good foods for long voyages, the explorers carried them home. Potatoes then were grown for sailors and fishermen, who introduced the handy root vegetable to the lands their ships visited during the 1600s. Since potatoes grew well in Europe and produced more calories per acre than other crops, they became a favorite, especially in Ireland. 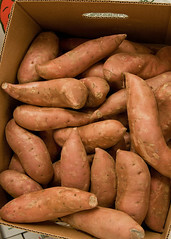 By the 1700s, European settlers had brought potatoes to North America. Get the Fat Out In? Today everyone talks about “good” and “bad” fat. We are cautioned to get the fat out of our diets—to eat fewer fatty foods and avoid serious health problems such as heart disease, cancer, and diabetes. It is hard not to eat too much fat, with french fries, doughnuts, pastries, and more tempting us. We need fat to be healthy—just the “good” kinds, and not too much. Before the 1900s, most people, including those in North Carolina, hungered for more fat. Their diets often were low in this nutrient needed to furnish fuel for activity and to keep them warm, a problem that continues in much of the world. “Bears are rather large, more than 300 lbs. in weight. Bear meat is considered very wholesome, and Bear fat, with salad, is as good as Olive Oil.” (from Records of the Moravians in North Carolina, 2:577) American Indians, Europeans, and Africans in early North Carolina hunted bears and enjoyed their fat. People also ate opossum, beaver, and groundhog for their fat meat. Plump, delicious passenger pigeons were hunted in such large numbers that they became extinct. After explorers and settlers brought hogs to North Carolina, bacon, ham, and lard became common sources of fat. If you could time-travel to the Revolutionary War period, you would be very surprised at the ketchup that might flavor your food. The first ketchups were made of mushrooms or walnuts. They were more like today’s Worcestershire sauce and other spicy brown steak sauces. You would not have tasted tomato ketchup until the 1800s. Handwritten recipes (ca. 1816–1834) left by the Cameron family of central North Carolina included the newly fashionable tomato ketchup, as well as the traditional mushroom and walnut versions. Opossum meat may not show up on your dinner plate, but it has shown up on many others! Lawson, the 1701 traveler, wrote: “At Night we kill’d a Possum, being cloy’d [or “full up” from eating] with Turkeys, made a Dish of that, which tasted much between young Pork and Veal; their Fat being as white as any I ever saw.” Even in the 1900s, people commonly caught opossums, caged them, and fed them things like corn and sweet potatoes to try and improve their flavor before cooking them. Some people preferred opossum meat instead of turkey for Thanksgiving dinner! Does turkey with dressing make you think of Thanksgiving or Christmas dinner? If you lived on North Carolina’s frontier in the 1700s, you might have eaten roasted turkey, chicken, or goose often. The really special dish for harvest feasts, barn raisings, and other celebrations was a meat pie. A meat pie required more ingredients and was harder to cook than a roasted bird. Although often called a “sea pie,” it did not contain seafood, but meat preserved with salt, which kept well even on a sea voyage. A typical meat pie might have included ham, along with chicken and onions, potatoes, or apples. Have you eaten chicken pie? Modern chicken pies are the descendants of those early sea pies. A homemade meat pie is still a delicious treat. Perhaps you might like to add one to Thanksgiving dinner to remember your ancestors’ feasts. At the end of winter in colonial times, many people were unhealthy after months of eating dried foods such as corn and beans, and salt-cured foods like ham, bacon, and pickles. Those first springtime greens acted like a miracle medicine. Folks of every cultural group harvested early chickweed and wild mustard greens, then lamb’s-quarter and pokeweed, to go with greens grown in their gardens. Eggs also were plentiful in spring. A dish of greens and eggs cooked together was a favorite tonic for restoring strength and health. Families ate fruits and vegetables grown in backyard gardens and on nearby farms. They enjoyed salad greens in spring and early summer. They got fresh strawberries only in May. Folks looked forward to tomatoes, green beans, and corn-on-the-cob in summer. Root vegetables and pumpkins starred on autumn tables. To get through winter, people relied on fruits and vegetables they had dried or “canned.” Tropical fruits like bananas and oranges did not grow in North Carolina. They came by ship from the Caribbean to Wilmington or other ports, and therefore, these fruits were expensive and available at limited times. Large meat animals such as cattle and hogs were usually butchered in colder weather, so fresh meat was most available during the fall and winter. The rest of the year, people ate preserved meats like ham, bacon, and sausage more often. Small meat animals such as chickens might have been eaten in any season. Eggs and milk had seasonal availability as well. Eggs were a welcomed part of spring, but they became scarcer as the summer passed and chickens stopped laying during shorter daylight hours. Since a cow gives milk only after she has a calf, your great-grandparents may not have had milk to drink year-round. Today we find almost everything in our grocery stores all year, with products from across the country and even around the world. However, many people still like to shop “in season” at farmers markets and produce stands for the freshest, most luscious fruits and vegetables. Such favorites as locally grown tomatoes and peaches are much better than those shipped from distant farms. Perhaps your family grows vegetables or fruits. If so, you have experienced the freshest possible foods! At the time of this article’s publication, Kay K. Moss was adjunct curator for eighteenth-century lifeways studies at the Schiele Museum of Natural History in Gastonia. She authored Southern Folk Medicine: 1750–1820, Journey to the Piedmont Past, and Decorative Motifs from the Southern Backcountry, and coauthored The Backcountry Housewife: A Study of Eighteenth-Century Foods. Counter Culture May 23, 2010, Hurdle Mills, North Carolina. 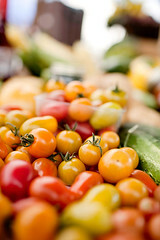 "Farm to Fork 2010 Picnic." Located at http://www.flickr.com/photos/counterculturecoffee/4682621763/. Accessed February 21, 2010. USDAgov. November 18, 2010. "10di1554-04." Located at http://www.flickr.com/photos/usdagov/5216027139/. Accessed February 21, 2010. 1 January 2009 | Moss, Kay K.
Thank you website. This will help me with my 5th grade report on North Carolina! Thanks for letting us know! I'm glad it was helpful. Good luck with your project! I am in 4th grade. I have a lot of projects due this year. I am using this website often. It is very helpful to me.